Jun 1st - Yay! Check out www.audiostreet.net I'm the featured artist for the month there. Hopefully, a few more people should get to know me and my music from that bit of free publicity. Jun 2nd - My music could be getting heard across Liverpool on Juice FM Radio and nightclub events there. I'll post more details if I get them but at the moment a DJ at the station has hold of most of my original music and a couple of my bootlegs. Lets hope he likes them and can play some of them out. It would be something extra to add to my musical CV. Jun 3rd - I seem to be getting a fair few emails from people who are enjoying my "donk-donk", scouse house type tracks. I pretty much consider them as just throw away nonsense I make for fun but people are actually liking them and requesting that I make some more and maybe consider sending them to a label called Cheeky Trax who specialise in this type of music. An example of one is here. All it is made up of is a thumping beat with a wooden sounding off-beat bass and a vocal laid on the top. Perhaps this is a style I should develop more. I dunno? Jun 4th - Found out at the last minute that a guy who used to be with N-Trance (Mike Lewis) was guest Djing in town tonight. If I'd have known sooner, I could have made up a demo CD for him. Trouble is, I don't have a printer, so I'm dependent on a friend if I need to print anything off. I didn't think a hand written one would look too professional so unfortunately, I missed that opportunity. Jun 5th - Amazing news! I received a mail from a record label interested in signing Run Away, Alone In The Crowd, Tears In The Rain and How Many Times! They are called Neutone Recordings and are a medium sized label based in the U.S. Now normally when I get mails like these I just bin them, but I checked out this company and they seem legitimate. They have several artists on their roster and one of them, Kujay Dada, had a minor hit here in the U.K. earlier in the year. I haven't found any bad press about the company on the net and in fact all I could find, were glowing reports about the label and recommendations. It's quite funny really as I was talking to one of my friends last night and saying how I thought that this project was about to fail. He said to me, "Don't give up, you never know what's round the corner". How right he was! Neutone Recordings - They want to sign several of my tracks. Could this be the break I've been waiting for? Unfortunately, I can't sign Run Away and Tears In The Rain to them so it leaves me with the tracks that I made with Cami. I've let Cami know and she has agreed that we should try for this opportunity so I've mailed the label back and am waiting for their response. More news as I get it. Needless to say, I'm a very happy bear at the moment! Jun 6th - No response yet from them. Hope they're just busy and everything's still ok. I contacted the site where they had sent the mail from and no other artist there had been sent one, so I do think it was a genuine offer. Normally, dodgy labels tend to mass mailshot everyone they can find on a music site and see which artists bite. It appears that they have targeted me out individually so I hope they get back in touch soon. Jun 7th - Still nothing. Hope they haven't changed their minds. I'll give them another few days then I'll mail them back and see what's happening. Jun 8th - And there's still no reply from them. I haven't heard any more from the Black Eyed Peas either, so it's not looking too good for that opportunity. Jun 9th - Mailed Neutone Recordings back to ask if they were still interested in the songs. Maybe I'm just being impatient but they exchanged emails fairly quickly when they first contacted me and now it's been 4 days without any contact from them. Jun 10th - No reply to that email either. I guess they changed their minds for reasons known to themselves. I'm a little disappointed and it would have been helpful to me to know why they had decided not to use my songs. Jun 11th - Oops! I forgot to tell you all that I've been invited to appear on a mini compilation CD. It's a promotional thing rather than a money maker but it should be great publicity. It's comprised of three UK artists, each with two tracks on. I've chosen Run Away and Arctic Dawn, as they are the ones that seem to go down pretty well. It's hoped that the CD will be able in some branches of HMV. Good eh? Jun 12th - Got a reply back from Neutone Recordings but it's not good news I'm afraid. They've decided that they only want to sign Run Away to their label but unfortunately, as many of you will know, the track was signed to Home City Records and was released last summer in the UK. Neutone have said that they would need 50/50 publishing rights to the track and there's no way that Home City or Yana Kay, the vocalist will agree to that. They asked me to keep in touch though, so I'll let them know when I make some new vocal tracks. Euro 2004 - We wuz robbed! Unlucky lads. Hope things go better on Thursday against Switzerland. Jun 13th - Didn't do a lot today apart from cheer England on in their Euro 2004 match against France. (Have you seen my animation at the top of the page?) It was a beautiful sunny day, I had my England T-shirt on and even had my face painted with the English flag. It was all going great until injury time when France scored two goals and beat us. Ah well, we still have two more matches to redeem ourselves. Come on En-ger-land! *EDIT* I replaced the animation once England were knocked out of the tournament. Jun 14th - It might not be all bad news from Neutone Records. Although I can't give them Run Away, they say they want me to do a specific project for them. Sorry to sound mysterious but I don't know if I'm allowed to tell you any further details at this moment in time. I'll post more information later if possible, but for now, let's just say that it's very good news! Jun 15th - Started work on the project from Neutone Records. It's quite unlike anything I've done before, as they want me to make them a "special" kind of remix. The last time a similar style was attempted, the track in question reached number 1 in the UK charts. Again, I'm sorry to sound vague but it will all become clear in the next few days/weeks. I don't wish to jeopardise the plan by giving too much away at this time. Jun 16th - Continued the remix work for Neutone. I uploaded an idea I had for the track and got a phone call from one of the directors of the company to say that he liked what I had done but it wasn't exactly what they wanted. He explained a few more details about the track and gave me a few ideas for it. Jun 17th - Worked some more on the track and went out to watch En-ger-land give Switzerland a 3-0 beating. Well done boys! Jun 18th - The remix is proving quite tricky really. Without giving too much away, they have given me an instrumental of a popular song and want me to put a vocal on the top of it. So I'm trying to find one that meets their criteria and matches the instrumental's key. It's a bit trial and error at the moment but hopefully, I'll find one. Jun 19th - Still looking for that elusive vocal. I've a library of hundreds of acapellas so I've made a list of the ones that could work and I'm trying each one to see if it matches the instrumental's key. If I'm desperate, I can always change the key of the vocal but I'd rather not as it won't sound the same as the original track. Jun 20th - I was in The Macintosh Arms, which is a local pub in town, and the DJ was playing several of my tracks, as he usually does on a Sunday night. I overheard two girls talking to each other. One said, "Shall we go to The Peacock?" (another pub) and her mate said, "No, let's stay in here. The music is much better!". Hehe! It was a great buzz for me to hear that and to make it even better, once my tracks had finished and the DJ was playing some chart sounds, the girls left. I mentioned to the landlord that he should get me a pint as I had made him a bit of custom that he wouldn't otherwise have had, but he didn't seem impressed. Jun 21st - Bah! Still can't find any vocal that will work over the instrumental. I tried changing the key of the vocal I had in mind but it didn't sound very natural. It's not looking too promising. Jun 22nd - Still looking but with little success. I'm nearly through my library of acapellas and although a few fit the key of the music, they don't really work with the concept I have been given by the label. I'll keep looking and trying the different ones I have but I don't think I'm going to be able to do this in the way that the label want. Jun 23rd - I got a mail from Alison of Manchester who reads this section of the site. She wants to volunteer to be part of my street team. You may remember from a month or two ago that I received a mail from two people (Kelly and Sam of Sheffield) who were willing to hand my CDs out to DJs around their area. I've since had a couple more emails from volunteers (Michelle and Dan) and this was another one today. I must get some more demo CDs done to hand out to these people. Thanks again to all of you. It really means a lot to me and I appreciate you taking the time to do this. If anyone else is willing to help, please email Street Team and I'll send a few CDs for you to hand out. If anything comes of this project, I promise I'll remember you all. Jun 24th - Continued to search for a suitable vocal. I've nearly been all the way through my library now without finding one that works successfully. I might have to ask them if I can change the backing instrumental. 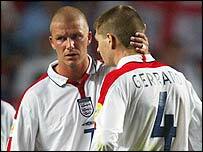 Later in the evening, I went out to support England in the first knockout round of Euro 2004. They scored the winning goal late in the match but it was disallowed by a very dubious decision by Urs Meier the referee, who seemed extremely biased towards the opposition all the way through the match. Every time the two teams clashed, he gave the opposition the advantage. Our star player Wayne Rooney had a bone in his foot broken by one of the opposing players and the referee gave the opposition a free kick! Apparently, Mr Meier was from Switzerland and I think he was getting his own back on England for beating his home team 3-0 earlier in the week! Play some covers as well as original material - This helps ensure that the audience will know at least a few of your tracks. Place a few fans/friends in the crowd - You'll always have someone to cheer you along and the audience is more likely to be appreciative if they see others are enjoying themselves. Introduce the band half way through your set - You'll appear a little less anonymous. No need for lengthy past histories, just a quick, "..and this is Nick on guitar, this guy invented rock and roll..", as "Nick" plays out a little solo. The best time to do this appears to be about halfway through the set as the audience has had time to get to know and watch you. Putting some names to the faces makes it a more personal and enjoyable experience. 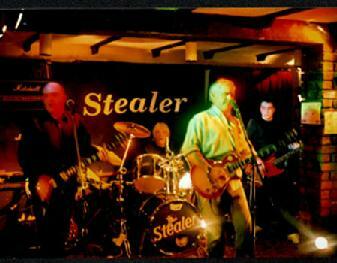 Stealer - They performed live from The Mac, Goole on the 25th June and went down extremely well with the locals. I got a few tips from watching them for if I ever play live. Although we certainly play different styles of music. Involve the crowd - The band had the crowd joining in by getting them clapping and shrieking along with some of their songs. This makes it more of a two way experience for the audience rather than a passive one. Don't have them doing it with every song though otherwise they will wonder who is supposed to be performing. Just do it with one song, and certainly no more than two. Have a novelty - They played a cover of Whole Lotta Rosie and had a rather large lady in a corset and suspenders dancing along to it, which was certainly unusual and will help them to be remembered for a long while. As one guy said to me, "You don't see this in Wetherspoons!" Jun 26th - Got a good link from one of the regular readers of this section. It was from James, who runs the website of a DJ named Darren Stone. Darren has played alongside Judge Jules, Seb Fontaine, John Kelly, Tall Paul, etc. and at places such as Ministry of Sound and Godskitchen. James has offered to pass my demo to Darren to play out in his set and film the crowd's reaction to my tracks. YIKES! Cheers James. Thanks for your support. Jun 27th - Continued to search for an acapella to fit the remix I'm working on for Neutone Records and also put a few notes down on a new track I've just started. There's no title as yet, but I had a little melody floating round my head earlier, so I put it down and will work some more on it. It's about time I made a new track. Jun 28th - Worked some more on the new track. I've given it a working title of Hard To Believe and it's coming along slowly but surely at the moment. I may have to pull the plug on the Neutone remix though, as I can't find any acapella that works as well as I would like with the instrumental. Jun 29th - I've been receiving internet radio airplay on a station called AiiRadio. I was sent an email from someone who had heard my music on the station and was impressed with it. I love receiving mails like that. It makes it all seem worthwhile somehow and it's great to know that people are enjoying my music. Jun 30th - I found a record company who release music similar to mine and best of all, they accept online submissions. This involves me uploading a sample of my music in mp3 format for them to listen to and they contact me if they are interested in hearing more. More and more record companies are starting to work this way, as it means they are not inundated with demo CDs, photos, biographies and they can listen to the tracks on their PC, laptop etc while doing other work. I uploaded Arctic Dawn, as it's a track that had the same style as a few of the other tracks there. The website said to allow 14 days for a response, so I hope they like it.